In Explicit intents we specify which exact Activity need to be started by giving the class of the Activity to be started. Android OS will start that exact Activity. Implicit intents on the other hand behave differently. In implicit intents you provide various parameters like action, category, data etc. Activity that supports these parameters will be started by Android OS. For eg. lets say we provide "view" action which is the action to view a web page in browser. Android OS will see a browser (lets say chrome) supports this action and will start it. But wait a minute - what happens when multiple activities support these parameters. Like when we have multiple browsers installed. In this case Android OS will simply give option to the user to choose from list of Activities that support those combination of parameters. We will see these is detail a little later. 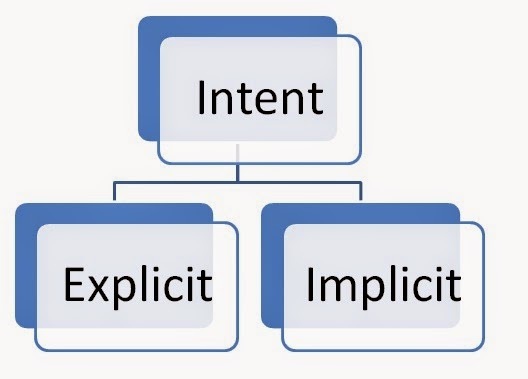 But I hope you got the overview of the basic difference between explicit and implicit intents. Primary Activity will have a button which on press will start Secondary Activity using an explicit intent. You can test it on your Android device or emulator. Pressing on "Start Secondary Activity" loads the secondary Activity. So when the button is pressed we create a intent with Application context and class of Activity that needs to be started (Explicit intent). Then we simply start the activity using startActivity() method. Now lets see how implicit intents are used. As mentioned earlier implicit intents are kind of generic intents that are used to fire up Activities supporting some action. For example activities that can understand web page URLs and render them (typically browsers). As we know there can be many such activities (many browsers installed or same android OS for instance). In this case Android OS lets user decide which activity should be started. Lets see this in code. We will try to open simple google URL - "http://www.google.com" using proper intent. Lets refactor our Primary Activity to use implicit intent and render the google URL. Here the logic in onClick() method is slightly changed. Instead of using an Intent with Application Context and the class of Activity to be started we are providing it with an Action (Intent.ACTION_VIEW) and a data which is essentially an URI. Note : Think of chooserIntent as a wrapper Intent. When the dialog is shown to choose from multiple activities that support the action (category, data etc) the title text can be supplied using such Chooser Intents [See the second argument of Intent.createChooser() method call.]. Lets see this in action. UI for PrimaryActivity is the same. Click on the "StartSecondaryActivity" to launch implicit intent. I hope you got the difference between the two - implicit and explicit intents. If you are wondering what is the action (Intent.ACTION_VIEW) and the data that we supplied are and how intents are related see following documentation links. Infact the MyBrowser Activity you saw in chooser list is one of the browser like demo app that I had created. These intent filters tell Android OS that this activity is a launcher activity.